Probably the world's most widely used virtual manipulation device. 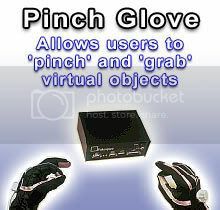 Allows users to 'pinch' and 'grab' virtual objects or initiate action. Each finger can be programmed to generate different actions. Users can program as many functions as can be remembered. The PINCH Glove System provides a reliable, low cost method of recognizing natural gestures. The PINCH System uses cloth gloves with electrical sensors in each fingertip. Contact between any two or more digits completes a conductive path, and a complex variety of "pinch" gestures can be programmed into applications. A pinching gesture can be used to grab a virtual object and a finger snap can be used to initiate an action. The System includes a pair of gloves, tracker mounts, interface electronics, user's guide, and software. The standard RS-232 serial interface allows the PINCH to be used with virtually any workstation or PC.